Many of us take for granted the daily resources we are provided with. Items that we believe aren't important are actually vitally significant in the daily needs of those experiencing homelessness. For someone that has little to no possessions, these resources are crucial to their physical and mental health and the smallest item can make a big impact. Michigan Movement has biannual distributions of 100-200 care packages consisting of food, clothes, hygiene supplies, and resource lists. MPowers are constructed into gender specific categories: male, female. After months of research, pilot programs, feedback, and visioning, we created a list of specific items that meet the needs of our community in the most effective way possible. Every item in our packages has a purpose and was carefully chosen based on quantitive data and qualitative research. During our MPower events, MIM members directly interact with the community by sharing meals, stories, and laughs. These distributions transform community neighbors into lifetime friends! MIM listens and understands that community members are experts on their own lives and their own situations. We never donate items without first consulting the community to see what they actually need. Based on wish lists given to us by Alpha House, MIM donates monthly bins called Transitions to families who are transitioning from the shelter to a home. We make food with the community, not only for the community. MIM strives to make genuine and long-lasting relationships with community members at Mercy House. Mercy House is a place for anyone to come and receive free food and clothes, do laundry, take a shower, and talk to others. It is one of M.I.S.S.I.O.N. 's hospitality houses. It is highly valued among the community and has become a place of solidarity and peace. We volunteer with the community, not only for the community. 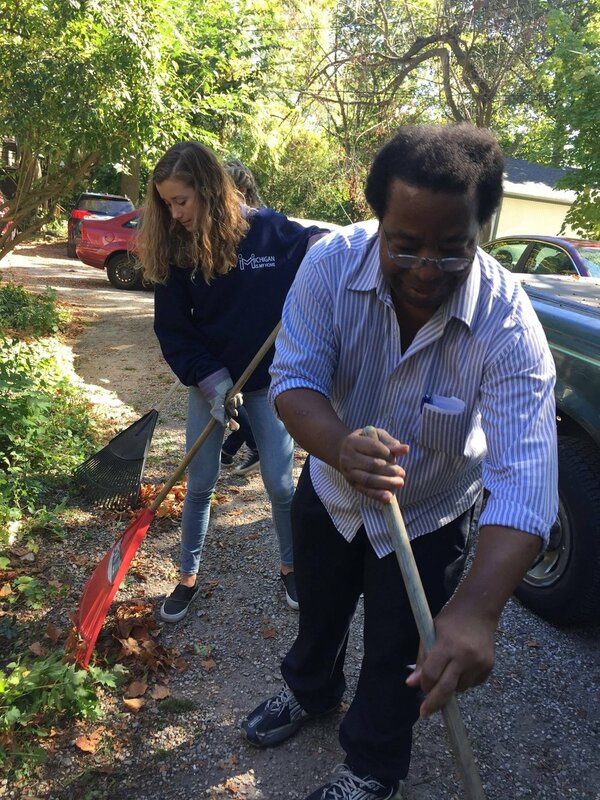 MIM firmly believes that all volunteer projects should be mutually beneficial for the community and volunteers-- this often only occurs when volunteers make a plan with, not for, the community. To combat the inaccessibility of feminine hygiene supplies for low-income populations, MIM donates as many supplies as possible. 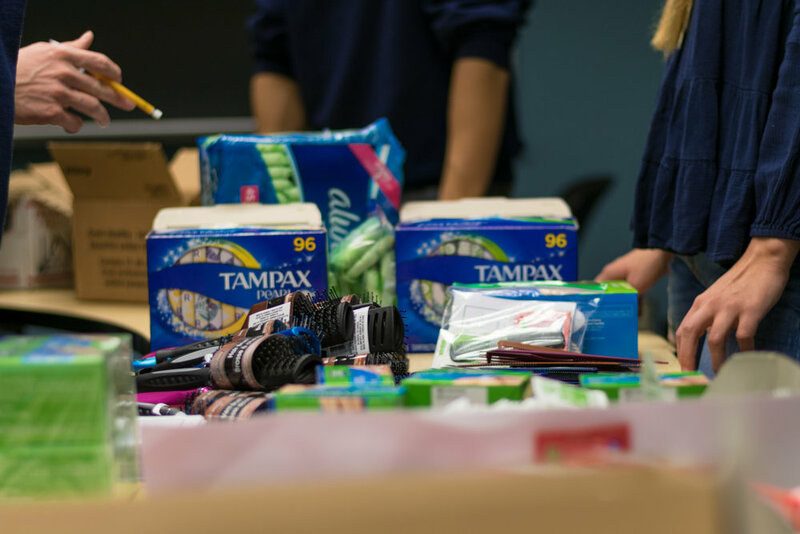 MIM, and partners of MIM, hold biannual feminine hygiene supply drives on U-M's campus. These drives have always been very well receipted among college students, resulting in many donations, and over $2,000 donated to buy more supplies. Humanity First single-handedly raised $900 for feminine hygiene supplies during the 2017-2018 school year. This allowed MIM to create separate male and female care packages and place enough supplies for one cycle (10 pads, 15 tampons) in each female bag. MIM strives to serve as friends and role models for children and teenagers who have experienced homelessness, poverty, or trauma in their past. Every semester, MIM volunteers at Avalon Housing, an affordable housing complex in Ann Arbor, to spend time with children. MIM members participate in various games and activities with the children, and then helps them with their homework if needed. Health disparities are growing in America and MIM believes it is time to intervene. Diabetes, obesity, and gastrointestinal disorders are rising at rates higher than ever before. Therefore, during the 2018-2019 school year, MIM is implementing programs that gets local low-income children engaged in activity, sports, and healthy food choices. Lack of education, equipment, and space contribute to the growing disparities. Based on local wish lists that MIM receives (e.g. basketball court, tennis racquets, playground), MIM will raise money for requested projects. Ann Arbor is the 8th most economically segregated city in the United States, but many individuals are unaware of this fact. From the surface, Ann Arbor appears to be an affluent and wealthy community, resulting in low-income populations to be invisible. In addition, affordable housing in Ann Arbor is increasingly harder to come by; students and community members alike are being forced out of Ann Arbor and into neighboring cities, such as Ypsilanti, for residence. The goals of the social advocacy committee are to raise awareness on the above issues, advocate for low-income populations both on and off campus, and engage with local politicians to try to make long-lasting policy change. Every November, organizations across the U.S. hold events related to hunger and homelessness in order to advocate for policy change, donate items and food to underserved populations, and educate others on the current food insecurity and housing crises. MIM participates in this week and engages the Ann Arbor community. In November of 2018, MIM will hold events that: allow low-income individuals to share their stories, show documentaries, donate 300 care packages to individuals in need, and highlight local and national policies. MIM's goal for this week is to create a call to action and make a difference for those whose voices are silenced. 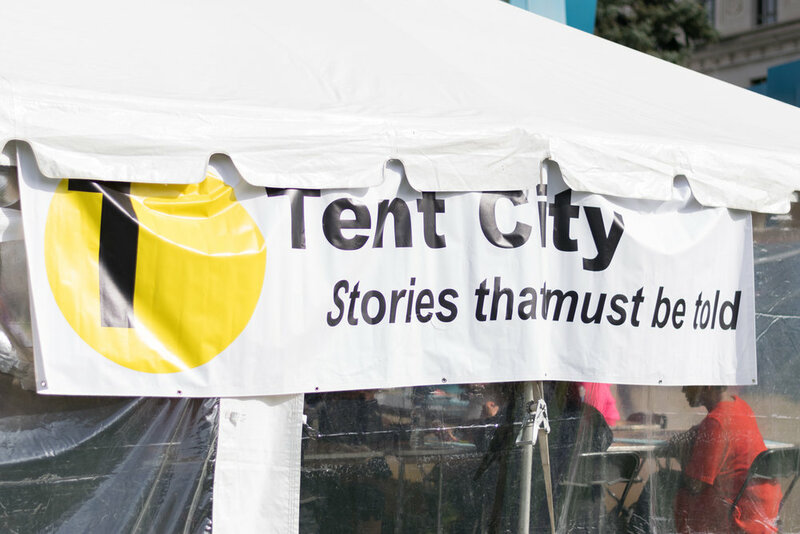 One Matters goes above and beyond every fall to hold Tent City in Toledo, Ohio. 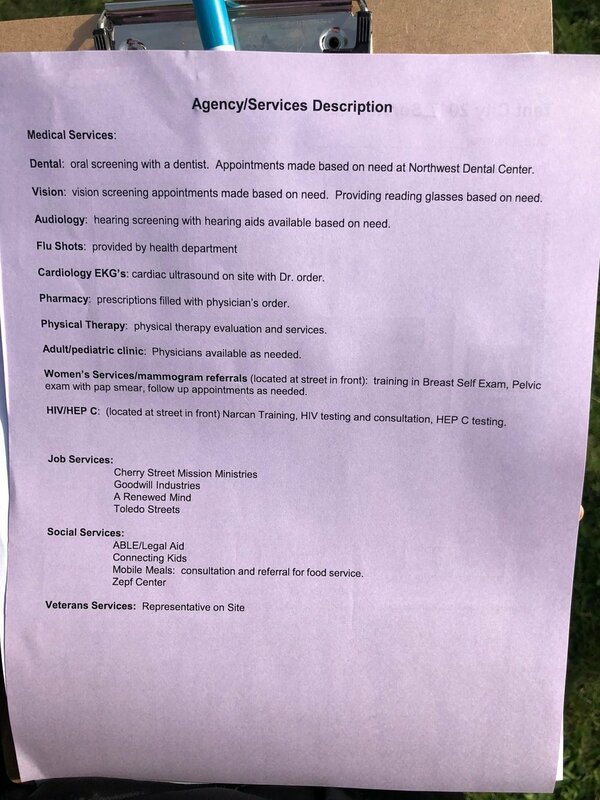 Low-income individuals that register for the event are able to receive free medical and dental services, haircuts, food, clothes, birth certificates, I.D.s, and information on local social services. Each registrant is paired with a guide (e.g. MIM members) to walk them around the event and ensure they are getting the services they need most. MIM envisions a "mini Tent City" in Ann Arbor, where individuals are able to receive the services that are most crucial to their health and wellbeing. Contact us if you would like to help us create this event, or if you know someone else who would be interested! MIM strives to create a community within the organization. We strongly believe in creating meaningful relationships among members and the executive board, all of whom are passionate about addressing homelessness and poverty in the local community. Some of MIM's favorite social events are ice skating at Yost, bowling at Revel and Roll, and ice cream at Blank Slate Creamery.